Are you full to the brink and cannot think of eating another morsel of food until next Christmas? Well then you live in the wrong country. One cannot live in France without partaking in their numerous food delights! It’s one thing trying to pass up on the glorious bread, cakes, pastries and cheeses on an everyday all year around basis but then they throw in seasonal specialities like Foie gras, Bûche de Noel and glazed chestnuts to name a tiny percentage of the Christmas season delicacies. 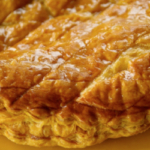 When you think you’ve had enough, there’s La Galette des Rois which is this sumptuous flaky pastry filled with frangipane or other mouth watering fillings like almond cream, apple compote or even chocolate and eaten on the 6th of January, the day of Epiphany. 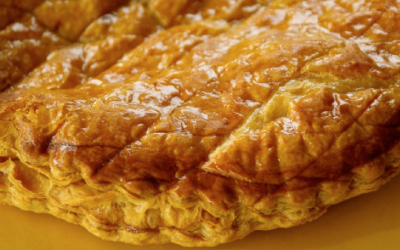 There are various versions of the Galette depending on which part of France you live in and there is this big debate about which is better between brioche and pastry but either one is delicious and all versions come with a heavy but scrumptious calorie baggage. Traditionally, the youngest child gets under the table and unseeingly allocates a piece to the various friends and family members present. 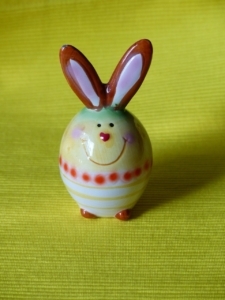 This is because there is a little “féve”, a trinket, which originally used to be a broad bean but is now, often a little porcelain figure or object hidden in the tart. The person who finds it gets to be King and gets to wear a cardboard crown provided with the tart when you buy it. This is all fun unless you have a child who never finds the ‘féve’ so then you need to get in line again for round 2 or 3 (yes people queue for these yummy tarts at Boulangeries who have a good reputation for these delights). Your wallet is the only thing to get thinner this season! Some places to find a good Galette in the neighbourhood or if you’d like to try your hand at making one, there’s a simple recipe below! • 2 rolls of Puff pastry (pâte feuilletées). - Mix together the sugar and ground almonds. - Add the butter and cream it together until thoroughly mixed. - Beat in the eggs one by one. - Place one puff pastry disc on a baking sheet lined with baking parchment. Pipe the almond mixture on the pastry leaving 4-5 cms edge around the diameter then brush the egg wash around the edge, hide your ‘féve’ then cover the mixture with the 2nd pastry disc ensuring that the two discs are firmly pinched together and scalloped. Lightly score the top of the disc working from a centre point outward in a sun ray pattern. - Let the pastry chill for an hour in the fridge. - Preheat your oven to 180°C, and then bake your tart for 35-40 mins or until nice and golden.